Secretary of Health and Human Services Tom Price took private jets on at least five separate flights last week in a stark departure from his predecessors under the Obama administration. Price took five flights between Washington D.C., Maine, New Hampshire and Pennsylvania between Sept. 13 and Sept. 15 for official business, according to internal HHS documents cited by Politico. A spokesperson who said Price charters private jets when commercial flights aren’t feasible did not elaborate on why that was the case last week. 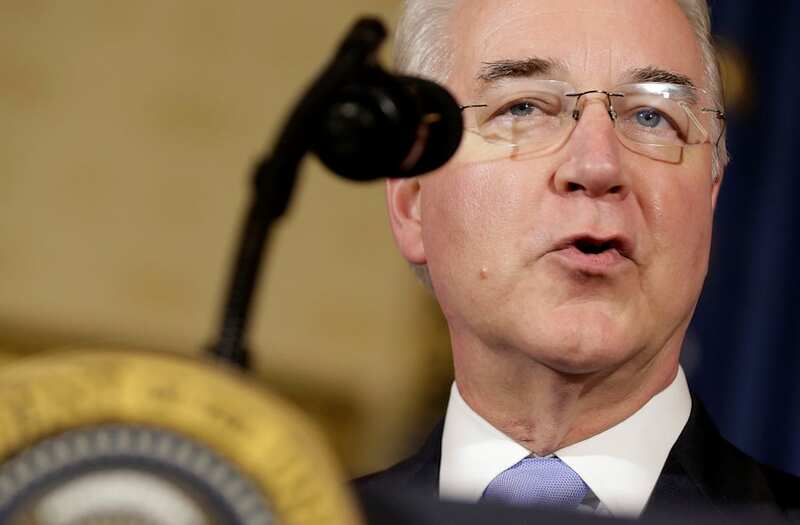 Current and former staffers told Politico that Price - who was confirmed in February - had been traveling on private jets for months, breaking precedent from the two previous HHS secretaries who flew commercially within the continental U.S.
Before serving in Congress, Zinke, who has an MBA, started Continental Divide International in 2005, a property management and business development consulting company. He later formed a consulting company, On Point Montana, in 2009. Pence became an attorney in a private practice after graduating from law school before serving in Congress and then becoming the Governor of Indiana. Former Texas Gov. Rick Perry banks at least $100,000 from speeches and $250,000 from consulting Caterpillar. Additionally, the politician has about 20% of his portfolio invested in in oil-and gas partnerships and energy stocks, according to Forbes. Kelly, who spent over four decades in the military, amassed the majority of his wealth from government pension. Like Kelly, the four-star general made most of his money from government pension. He also sits as a director of General Dynamics. Sessions owns more than 1,500 acres in Alabma that are worth at least $2.5 million. The rest of his fortune is in Vanguard mutual funds and municipal bonds, according to Forbes. Price ran an orthopedic clinic in Atlanta for 20 years, then taught orthopedic surgery as an assistant porfessor at his alma mater, Emory. The daughter of a shipping magnate owes the buld of her and her husband Mitch McConnell’s wealth to her family. The neurosurgeon earned millions from books he penned, media roles and speaking gigs. He also served as a director at Kellogg and Costco, accumulating more than $6 million in stocks. The CEO of CKE Restaurants, which owns Carl’s Jr. and Hardee’s, has earned at least $25 million in salary and bonuses since 2000. The former Goldman Sachs partner purchased subprime mortgage lender IndyMac for $1.6 billion in 2009 with a group of billionaire investors and sold it for $3.4 billion six years later. The former ExxonMobil chairman and CEO accumulated more than 2.6 million shares of company stock in his tenure and hefty pay packages, according to Forbes. The daughter of a shipping magnate owes the bulk of her and her husband Mitch McConnell’s wealth to her family. Known as the "King of Bankruptcy," the former banker bought bankrupt companies and later selling them for a large profit. “I find it hard to believe he couldn’t find a suitable commercial flight to Philadelphia,” according to Walter Shaub, former director of the United States Office of Government Ethics who stepped down this summer. News of Price’s travel emerged after other members in the Trump administration came under fire for similar reasons. Treasury Secretary Steven Mnuchin is under investigation for his use of a government jet on a trip to Kentucky. A watchdog group claimed the official trip was centered around viewing the solar eclipse near the path of totality, and Mnuchin’s wife Louise Linton was slammed online for flaunting her designer duds on the trip. It later emerged that Mnuchin requested government planes for his honeymoon with Linton in August. Mnuchin said he was concerned about secure communications during the trip before the jet was deemed unnecessary. The Environmental Protection Agency also announced a review of Scott Pruitt’s trips to his home state of Oklahoma, costing more than $12,000 in taxpayer money.